"Arrhythmia" redirects here. For other uses, see Arrhythmia (disambiguation). Heart arrhythmia (also known as arrhythmia, dysrhythmia or irregular heartbeat) is a group of conditions in which the heartbeat is irregular, too fast or too slow. A heart rate that is too fast – above 100 beats per minute in adults – is called tachycardia, and a heart rate that is too slow – below 60 beats per minute – is called bradycardia. Many types of arrhythmia have no symptoms. When symptoms are present, these may include palpitations or feeling a pause between heartbeats. In more serious cases, there may be lightheadedness, passing out, shortness of breath or chest pain. While most types of arrhythmia are not serious, some predispose a person to complications such as stroke or heart failure. Others may result in cardiac arrest. There are four main types of arrhythmia: extra beats, supraventricular tachycardias, ventricular arrhythmias and bradyarrhythmias. Extra beats include premature atrial contractions, premature ventricular contractions and premature junctional contractions. Supraventricular tachycardias include atrial fibrillation, atrial flutter and paroxysmal supraventricular tachycardia. Ventricular arrhythmias include ventricular fibrillation and ventricular tachycardia. Arrhythmias are due to problems with the electrical conduction system of the heart. Arrhythmias may occur in children; however, the normal range for the heart rate is different and depends on age. A number of tests can help with diagnosis including an electrocardiogram (ECG) and Holter monitor. Most arrhythmias can be effectively treated. Treatments may include medications, medical procedures such as inserting a pacemaker and surgery. Medications for a fast heart rate may include beta blockers or agents that attempt to restore a normal heart rhythm such as procainamide. This latter group may have more significant side effects, especially if taken for a long period of time. Pacemakers are often used for slow heart rates. Those with an irregular heartbeat are often treated with blood thinners to reduce the risk of complications. Those who have severe symptoms from an arrhythmia may receive urgent treatment with a controlled electric shock in the form of cardioversion or defibrillation. Arrhythmia affects millions of people. In Europe and North America, as of 2014, atrial fibrillation affects about 2% to 3% of the population. Atrial fibrillation and atrial flutter resulted in 112,000 deaths in 2013, up from 29,000 in 1990. Sudden cardiac death is the cause of about half of deaths due to cardiovascular disease and about 15% of all deaths globally. About 80% of sudden cardiac death is the result of ventricular arrhythmias. Arrhythmias may occur at any age but are more common among older people. Sounds of an irregular heart beat. Heart sounds of a 16 year old female with irregular heart rhythm. Arrhythmia may be classified by rate (tachycardia, bradycardia), mechanism (automaticity, re-entry, triggered) or duration (isolated premature beats; couplets; runs, that is 3 or more beats; non-sustained= less than 30 seconds or sustained= over 30 seconds). PVCs that occur at intervals of 2 normal beats to 1 PVC are termed "PVCs in trigeminy"
Third degree heart block, also known as complete heart block. First, second and third degree block also can occur at the level of the sinoatrial junction. This is referred to as sinoatrial block typically manifesting with various degrees and patterns of sinus bradycardia. Sudden arrhythmic death syndrome (SADS), is a term used as part of sudden unexpected death syndrome to describe sudden death due to cardiac arrest brought on by an arrhythmia in the presence or absence of any structural heart disease on autopsy. The most common cause of sudden death in the US is coronary artery disease specifically because of poor oxygenation of the heart muscle, that is myocardial ischemia or a heart attack  Approximately 180,000 to 250,000 people die suddenly of this cause every year in the US. SADS may occur from other causes. There are many inherited conditions and heart diseases that can affect young people which can subsequently cause sudden death without advance symptoms. Causes of SADS in young people include viral myocarditis, long QT syndrome, Brugada syndrome, Catecholaminergic polymorphic ventricular tachycardia, hypertrophic cardiomyopathy and arrhythmogenic right ventricular dysplasia. The term cardiac arrhythmia covers a very large number of very different conditions. The most common symptom of an arrhythmia is an awareness of an abnormal heartbeat, called palpitations. These may be infrequent, frequent, or continuous. Some of these arrhythmias are harmless (though distracting for patients) but some of them predispose to adverse outcomes. Some arrhythmias do not cause symptoms, and are not associated with increased mortality. However, some asymptomatic arrhythmias are associated with adverse events. Examples include a higher risk of blood clotting within the heart and a higher risk of insufficient blood being transported to the heart because of weak heartbeat. Other increased risks are of embolisation and stroke, heart failure and sudden cardiac death. If an arrhythmia results in a heartbeat that is too fast, too slow or too weak to supply the body's needs, this manifests as a lower blood pressure and may cause lightheadedness or dizziness, or syncope (fainting). Some types of arrhythmia result in cardiac arrest, or sudden death. Medical assessment of the abnormality using an electrocardiogram is one way to diagnose and assess the risk of any given arrhythmia. Each heart beat originates as an electrical impulse from a small area of tissue in the right atrium of the heart called the sinus node or Sino-atrial node or SA node. The impulse initially causes both atria to contract, then activates the atrioventricular (or AV) node, which is normally the only electrical connection between the atria and the ventricles (main pumping chambers). The impulse then spreads through both ventricles via the Bundle of His and the Purkinje fibres causing a synchronised contraction of the heart muscle and, thus, the pulse. In adults the normal resting heart rate ranges from 60 to 90 beats per minute. The resting heart rate in children is much faster. In athletes, however, the resting heart rate can be as slow as 40 beats per minute, and be considered as normal. The term sinus arrhythmia  refers to a normal phenomenon of alternating mild acceleration and slowing of the heart rate that occurs with breathing in and out respectively. It is usually quite pronounced in children and steadily decreases with age. This can also be present during meditation breathing exercises that involve deep inhaling and breath holding patterns. Normal sinus rhythm, with solid black arrows pointing to normal P waves representative of normal sinus node function, followed by a pause in sinus node activity (resulting in a transient loss of heart beats). Note that the P wave that disrupts the pause (indicated by the dashed arrow) does not look like the previous (normal) P waves — this last P wave is arising from a different part of the atrium, representing an escape rhythm. A slow rhythm (less than 60 beats/min) is labelled bradycardia. This may be caused by a slowed signal from the sinus node (sinus bradycardia), by a pause in the normal activity of the sinus node (sinus arrest), or by blocking of the electrical impulse on its way from the atria to the ventricles (AV block or heart block). Heart block comes in varying degrees and severity. It may be caused by reversible poisoning of the AV node (with drugs that impair conduction) or by irreversible damage to the node. Bradycardias may also be present in the normally functioning heart of endurance athletes or other well-conditioned persons. 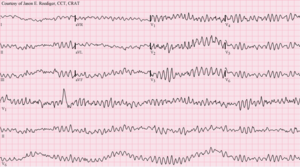 Bradycardia may also occur in some types of seizures. In adults and children over 15, resting heart rate faster than 100 beats per minute is labelled tachycardia. Tachycardia may result in palpitation; however, tachycardia is not necessarily an arrhythmia. Increased heart rate is a normal response to physical exercise or emotional stress. This is mediated by the sympathetic nervous system on the sinus node and called sinus tachycardia. Other conditions that increase sympathetic nervous system activity in the heart include ingested or injected substances, such as caffeine or amphetamines, and an overactive thyroid gland (hyperthyroidism) or anemia. Tachycardia that is not sinus tachycardia usually results from the addition of abnormal impulses to the normal cardiac cycle. Abnormal impulses can begin by one of three mechanisms: automaticity, re-entry or triggered activity. A specialised form of re-entry which is both common and problematic is termed fibrillation. Although the term "tachycardia" has been known for over 160 years, bases for the classification of arrhythmias are still being discussed. Congenital heart defects are structural or electrical pathway problems in the heart that are present at birth. Anyone can be affected with this because overall health does not play a role in the problem. Problems with the electrical pathway of the heart can cause very fast or even deadly arrhythmias. Wolff–Parkinson–White syndrome is due to an extra pathway in the heart that is made up of electrical muscle tissue. This tissue allows the electrical impulse, which stimulates the heartbeat, to happen very rapidly. Right ventricular outflow tract tachycardia is the most common type of ventricular tachycardia in otherwise healthy individuals. This defect is due to an electrical node in the right ventricle just before the pulmonary artery. When the node is stimulated, the patient will go into ventricular tachycardia, which does not allow the heart to fill with blood before beating again. Long QT syndrome is another complex problem in the heart and has been labeled as an independent factor in mortality. There are multiple methods of treatment for these including cardiac ablations, medication treatment, or lifestyle changes to have less stress and exercise. Automaticity refers to a cardiac muscle cell firing off an impulse on its own. All of the cells in the heart have the ability to initiate an action potential; however, only some of these cells are designed to routinely trigger heart beats. These cells are found in the conduction system of the heart and include the SA node, AV node, Bundle of His and Purkinje fibers. The sinoatrial node is a single specialized location in the atrium that has a higher automaticity (a faster pacemaker) than the rest of the heart and, therefore, is usually responsible for setting the heart rate and initiating each heart beat. Any part of the heart that initiates an impulse without waiting for the sinoatrial node is called an ectopic focus and is, by definition, a pathological phenomenon. This may cause a single premature beat now and then, or, if the ectopic focus fires more often than the sinoatrial node, it can produce a sustained abnormal rhythm. Rhythms produced by an ectopic focus in the atria, or by the atrioventricular node, are the least dangerous dysrhythmias; but they can still produce a decrease in the heart's pumping efficiency, because the signal reaches the various parts of the heart muscle with different timing than usual and can be responsible for poorly coordinated contraction. Conditions that increase automaticity include sympathetic nervous system stimulation and hypoxia. The resulting heart rhythm depends on where the first signal begins: If it is the sinoatrial node, the rhythm remains normal but rapid; if it is an ectopic focus, many types of dysrhythmia may ensue. Re-entrant arrhythmias occur when an electrical impulse recurrently travels in a tight circle within the heart, rather than moving from one end of the heart to the other and then stopping. Every cardiac cell is able to transmit impulses of excitation in every direction but will do so only once within a short time. Normally, the action potential impulse will spread through the heart quickly enough that each cell will respond only once. However, if there is some essential heterogeneity of refractory period or if conduction is abnormally slow in some areas (for example in heart damage) so the myocardial cells are unable to activate the fast sodium channel, part of the impulse will arrive late and potentially be treated as a new impulse. Depending on the timing, this can produce a sustained abnormal circuit rhythm. As a sort of re-entry, vortices of excitation in the myocardium (autowave vortices) are considered to be the main mechanism of life-threatening cardiac arrhythmias. In particular, the autowave reverberator is common in the thin walls of the atria, sometimes resulting in atrial flutter. Re-entry is also responsible for most paroxysmal supraventricular tachycardia, and dangerous ventricular tachycardia. These types of re-entry circuits are different from WPW syndromes, which utilize abnormal conduction pathways. Although omega-3 fatty acids from fish oil can be protective against arrhythmias, they can facilitate re-entrant arrhythmias. When an entire chamber of the heart is involved in multiple micro-reentry circuits and is therefore quivering with chaotic electrical impulses, it is said to be in fibrillation. Fibrillation can affect the atrium (atrial fibrillation) or the ventricle (ventricular fibrillation): ventricular fibrillation is imminently life-threatening. Atrial fibrillation affects the upper chambers of the heart, known as the atria. Atrial fibrillation may be due to serious underlying medical conditions and should be evaluated by a physician. It is not typically a medical emergency. Ventricular fibrillation occurs in the ventricles (lower chambers) of the heart; it is always a medical emergency. If left untreated, ventricular fibrillation (VF, or V-fib) can lead to death within minutes. When a heart goes into V-fib, effective pumping of the blood stops. V-fib is considered a form of cardiac arrest. An individual suffering from it will not survive unless cardiopulmonary resuscitation (CPR) and defibrillation are provided immediately. CPR can prolong the survival of the brain in the lack of a normal pulse, but defibrillation is the only intervention that can restore a healthy heart rhythm. Defibrillation is performed by applying an electric shock to the heart, which resets the cells, permitting a normal beat to re-establish itself. Triggered beats occur when problems at the level of the ion channels in individual heart cells result in abnormal propagation of electrical activity and can lead to sustained abnormal rhythm. They are relatively rare and can result from the action of anti-arrhythmic drugs. See early and delayed Afterdepolarizations. Tachyarrhythmias are the result of spontaneous action potentials arise from cardiac muscle cells. Cardiac arrhythmia are often first detected by simple but nonspecific means: auscultation of the heartbeat with a stethoscope, or feeling for peripheral pulses. These cannot usually diagnose specific arrhythmia but can give a general indication of the heart rate and whether it is regular or irregular. Not all the electrical impulses of the heart produce audible or palpable beats; in many cardiac arrhythmias, the premature or abnormal beats do not produce an effective pumping action and are experienced as "skipped" beats. The simplest specific diagnostic test for assessment of heart rhythm is the electrocardiogram (abbreviated ECG or EKG). A Holter monitor is an EKG recorded over a 24-hour period, to detect arrhythmias that may happen briefly and unpredictably throughout the day. A more advanced study of the heart's electrical activity can be performed to assess the source of the aberrant heart beats. This can be accomplished in an electrophysiology study, an endovascular procedure that uses a catheter to "listen" to the electrical activity from within the heart, additionally if the source of the arrhythmias is found, often the abnormal cells can be ablated and the arrhythmia can be permanently corrected. Transesophageal atrial stimulation (TAS) instead uses an electrode inserted through the esophagus to a part where the distance to the posterior wall of the left atrium is only approximately 5–6 mm (remaining constant in people of different age and weight). Transesophageal atrial stimulation can differentiate between atrial flutter, AV nodal reentrant tachycardia and orthodromic atrioventricular reentrant tachycardia. It can also evaluate the risk in people with Wolff–Parkinson–White syndrome, as well as terminate supraventricular tachycardia caused by re-entry. The method of cardiac rhythm management depends firstly on whether the affected person is stable or unstable. Treatments may include physical maneuvers, medications, electricity conversion, or electro- or cryo-cautery. In the United States, people admitted to the hospital with cardiac arrhythmia and conduction disorders with and without complications were admitted to the intensive care unit more than half the time in 2011. A number of physical acts can increase parasympathetic nervous supply to the heart, resulting in blocking of electrical conduction through the AV node. This can slow down or stop a number of arrhythmias that originate above or at the AV node (see main article: supraventricular tachycardias). Parasympathetic nervous supply to the heart is via the vagus nerve, and these maneuvers are collectively known as vagal maneuvers. There are many classes of antiarrhythmic medications, with different mechanisms of action and many different individual drugs within these classes. Although the goal of drug therapy is to prevent arrhythmia, nearly every anti arrhythmic drug has the potential to act as a pro-arrhythmic, and so must be carefully selected and used under medical supervision. A number of other drugs can be useful in cardiac arrhythmias. Several groups of drugs slow conduction through the heart, without actually preventing an arrhythmia. These drugs can be used to "rate control" a fast rhythm and make it physically tolerable for the patient. Some arrhythmias promote blood clotting within the heart, and increase risk of embolus and stroke. Anticoagulant medications such as warfarin and heparins, and anti-platelet drugs such as aspirin can reduce the risk of clotting. Arrhythmias may also be treated electrically, by applying a shock across the heart — either externally to the chest wall, or internally to the heart via implanted electrodes. Cardioversion is either achieved pharmacologically or via the application of a shock synchronised to the underlying heartbeat. It is used for treatment of supraventricular tachycardias. In elective cardioversion, the recipient is usually sedated or lightly anesthetized for the procedure. Defibrillation differs in that the shock is not synchronised. It is needed for the chaotic rhythm of ventricular fibrillation and is also used for pulseless ventricular tachycardia. Often, more electricity is required for defibrillation than for cardioversion. In most defibrillation, the recipient has lost consciousness so there is no need for sedation. Defibrillation or cardioversion may be accomplished by an implantable cardioverter-defibrillator (ICD). Electrical treatment of arrhythmias also includes cardiac pacing. Temporary pacing may be necessary for reversible causes of very slow heartbeats, or bradycardia (for example, from drug overdose or myocardial infarction). A permanent pacemaker may be placed in situations where the bradycardia is not expected to recover. Some cardiologists further sub-specialize into electrophysiology. In specialized catheter laboratories, they use fine probes inserted through the blood vessels to map electrical activity from within the heart. This allows abnormal areas of conduction to be located very accurately and subsequently destroyed by heat, cold, electrical, or laser probes in a process called catheter ablation. This procedure may be completely curative for some forms of arrhythmia, but for others, the success rate remains disappointing. AV nodal reentrant tachycardia is often curable by ablating one of the pathways in the AV node (usually the slow pathway). Atrial fibrillation can also be treated, by performing a pulmonary vein isolation, but the results are less reliable. Arrhythmias due to medications have been reported since the 1920s with the use of quinine. In the 1960s and 1970s problems with antihistamines and antipsychotics were discovered. It was not until the 1980s that the underlying issue, QTc prolongation was determined. ^ a b c d "What Are the Signs and Symptoms of an Arrhythmia?". National Heart, Lung, and Blood Institute. July 1, 2011. Archived from the original on 19 February 2015. Retrieved 7 March 2015. ^ a b c d e f g "What Is Arrhythmia?". National Heart, Lung, and Blood Institute. July 1, 2011. Archived from the original on 2 March 2015. Retrieved 7 March 2015. ^ a b c d e f g h i "Types of Arrhythmia". National Heart, Lung, and Blood Institute. July 1, 2011. Archived from the original on 7 June 2015. Retrieved 7 March 2015. ^ a b c d "Who Is at Risk for an Arrhythmia?". National Heart, Lung, and Blood Institute. July 1, 2011. Archived from the original on 3 March 2015. Retrieved 7 March 2015. ^ a b "How Are Arrhythmias Diagnosed?". National Heart, Lung, and Blood Institute. July 1, 2011. Archived from the original on 18 February 2015. Retrieved 7 March 2015. ^ a b c d e f g "How Are Arrhythmias Treated?". National Heart, Lung, and Blood Institute. July 1, 2011. Archived from the original on 17 February 2015. Retrieved 7 March 2015. ^ Zipes Douglas P.; Wellens Hein J. J. (1998). "Sudden Cardiac Death". Circulation. 98 (21): 2334–2351. doi:10.1161/01.CIR.98.21.2334. ^ Deo R, Albert CM (2012). "Epidemiology and genetics of sudden cardiac death". Circulation. 125 (4): 620–37. doi:10.1161/circulationaha.111.023838. PMC 3399522. PMID 22294707. ^ Chugh, Sumeet S.; Reinier, Kyndaron; Teodorescu, Carmen; Evanado, Audrey; Kehr, Elizabeth; Al Samara, Mershed; Mariani, Ronald; Gunson, Karen; Jui, Jonathan (2008). "Epidemiology of Sudden Cardiac Death: Clinical and Research Implications". Progress in Cardiovascular Diseases. 51 (3): 213–28. doi:10.1016/j.pcad.2008.06.003. PMC 2621010. PMID 19026856. ^ Winkel BG, Holst AG, Theilade J, et al. (2011). "Nationwide study of sudden cardiac death in persons aged 1–35 years". Eur Heart J. 32 (8): 983–90. doi:10.1093/eurheartj/ehq428. PMID 21131293. ^ Hayano J (Feb 2004). "Respiratory sinus arrhythmia: why does the heartbeat synchronize with respiratory rhythm?". Chest. 125 (2): 683–90. doi:10.1378/chest.125.2.683. PMID 14769752. ^ Peressutti, Caroline; Martín-González, Juan M.; m.García-Manso, Juan; Mesa, Denkô (2010). "Heart rate dynamics in different levels of Zen meditation". International Journal of Cardiology. 145 (1): 142–146. doi:10.1016/j.ijcard.2009.06.058. PMID 19631997. ^ Moskalenko, A. (2012). "Tachycardia as "Shadow Play"". In Yamada, Takumi (ed.). Tachycardia. Croatia: InTech. pp. 97–122. ISBN 978-953-51-0413-1. Archived from the original on 2013-05-08. ^ Wiener, Norbert; Rosenblueth, Arturo (1946). "The mathematical formulation of the problem of conduction of impulses in a network of connected excitable elements, specifically in cardiac muscle". Archivos del Instituto de Cardiología de México. 16 (3): 205–65. PMID 20245817. ^ Allessie, M. A.; Bonke, F. I.; Schopman, F. J. (1976). "Circus movement in rabbit atrial muscle as a mechanism of tachycardia. II. The role of nonuniform recovery of excitability in the occurrence of unidirectional block, as studied with multiple microelectrodes". Circulation Research. 39 (2): 168–77. doi:10.1161/01.RES.39.2.168. PMID 939001. ^ Mandel, William J., ed. (1995). Cardiac Arrhythmias: Their Mechanisms, Diagnosis, and Management (3 ed.). Lippincott Williams & Wilkins. ISBN 978-0-397-51185-3. ^ Denruijter, H; Berecki, G; Opthof, T; Verkerk, A; Zock, P; Coronel, R (2007). "Pro- and antiarrhythmic properties of a diet rich in fish oil". Cardiovascular Research. 73 (2): 316–25. doi:10.1016/j.cardiores.2006.06.014. PMID 16859661. ^ Shen, H; Choe, W (April 2011). "Spontaneous high-frequency action potential". Science China Life Sciences. 54 (4): 311–35. doi:10.1007/s11427-011-4157-y. PMID 21509656. ^ Meigas, K; Kaik, J; Anier, A (2008). "Device and methods for performing transesophageal stimulation at reduced pacing current threshold". Estonian Journal of Engineering. 57 (2): 154. doi:10.3176/eng.2008.2.05. ISSN 1736-6038. ^ a b Pehrson, Steen M.; Blomströ-LUNDQVIST, Carina; Ljungströ, Erik; Blomströ, Per (1994). "Clinical value of transesophageal atrial stimulation and recording in patients with arrhythmia-related symptoms or documented supraventricular tachycardia-correlation to clinical history and invasive studies". Clinical Cardiology. 17 (10): 528–534. doi:10.1002/clc.4960171004. ISSN 0160-9289. PMID 8001299. ^ a b c Heist, EK; Ruskin, JN (5 October 2010). "Drug-induced arrhythmia". Circulation. 122 (14): 1426–35. doi:10.1161/circulationaha.109.894725. PMID 20921449.